The body is both the subject and object of intentionality: qua Leib, it experiences worldly things and qua Körper, it is experienced as a thing in the world. This phenomenological differentiation forms the basis for Helmuth Plessner’s anthropological theory of the mediated or eccentric nature of human embodiment, that is, simultaneously we both are a body and have a body. Here, I want to focus on the extent to which this double aspect of embodiment (qua Leib and Körper) relates to our experience of temporality. Indeed, to question, does this double bodily relation correspond to a twofoldtemporality of embodied intentionality? In the first part of this paper, I differentiate between the intentional temporality of being a body and the temporal experience of having a body. To further my argument, in the second part, I present examples of specific pathologies, as well as liminal cases of bodily experiences, wherein these temporal dimensions, which otherwise go hand-in-hand, become dissociated. Phenomenologically, I want to argue that Husserl’s differentiation between Leib and Körper corresponds to two genetic forms of intentionality – operative and act (or object) intentionality – and that these are, in turn, characterized by different temporalities. Anthropologically, I want to argue that having a body – what occurs as an inherent break to human embodiment – is the presupposition for the experience of a stable and object-like time. I will conclude that the double aspect of human embodiment and in particular the thematic experience of having a body enables both the experience of a past, which is remembered, and a future that is planned. The body is both the subject and object of intentionality: qua Leib, it experiences worldly things and qua Körper, it is experienced as a thing in the world. This phenomenological differentiation forms the basis for Helmuth Plessner’s anthropological theory of the mediated or eccentric nature of human embodiment, that is, simultaneously we both are a body and have a body. Here, I want to focus on the extent to which this double aspect of embodiment (qua Leib and Körper) relates to our experience of temporality. Indeed, to question, does this double bodily relation correspond to a twofoldtemporality of embodied intentionality? 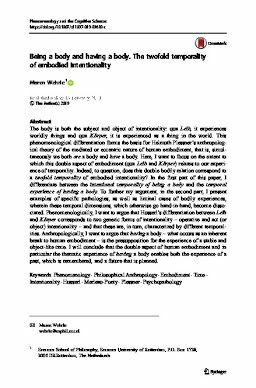 In the first part of this paper, I differentiate between the intentional temporality of being a body and the temporal experience of having a body. To further my argument, in the second part, I present examples of specific pathologies, as well as liminal cases of bodily experiences, wherein these temporal dimensions, which otherwise go hand-in-hand, become dissociated. Phenomenologically, I want to argue that Husserl’s differentiation between Leib and Körper corresponds to two genetic forms of intentionality – operative and act (or object) intentionality – and that these are, in turn, characterized by different temporalities. Anthropologically, I want to argue that having a body – what occurs as an inherent break to human embodiment – is the presupposition for the experience of a stable and object-like time. I will conclude that the double aspect of human embodiment and in particular the thematic experience of having a body enables both the experience of a past, which is remembered, and a future that is planned. The body is both the subject and object of intentionality: qua Leib, it experiences worldly things and qua Körper, it is experienced as a thing in the world. This phenomenological differentiation forms the basis for Helmuth Plessner’s anthropological theory of the mediated or eccentric nature of human embodiment, that is, simultaneously we both are a body and have a body. Here, I want to focus on the extent to which this double aspect of embodiment (qua Leib and Körper) relates to our experience of temporality. Indeed, to question, does this double bodily relation correspond to a twofoldtemporality of embodied intentionality? In the first part of this paper, I differentiate between the intentional temporality of being a body and the temporal experience of having a body. To further my argument, in the second part, I present examples of specific pathologies, as well as liminal cases of bodily experiences, wherein these temporal dimensions, which otherwise go hand-in-hand, become dissociated. Phenomenologically, I want to argue that Husserl’s differentiation between Leib and Körper corresponds to two genetic forms of intentionality – operative and act (or object) intentionality – and that these are, in turn, characterized by different temporalities. Anthropologically, I want to argue that having a body – what occurs as an inherent break to human embodiment – is the presupposition for the experience of a stable and object-like time. I will conclude that the double aspect of human embodiment and in particular the thematic experience of having a body enables both the experience of a past, which is remembered, and a future that is planned.